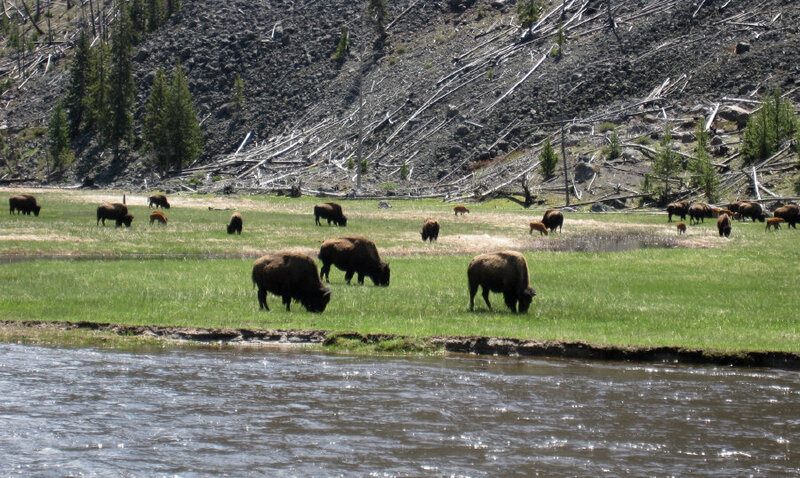 Visit the crown jewels of the National Park system where wildlife abounds. Ice cold freshets rush along the road as we cycle north through the pine forests and aspen glades toward Yellowstone National Park. 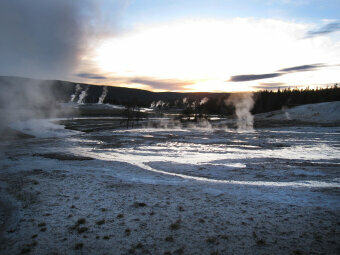 Its magic unveils itself in rising mists of simmering turquoise hot pools and gushing spouts of thundering geysers. Cinnamon bison babies frolic amidst wildflowers and tender green grass in Teton National Park. Mountain lakes sparkle under the ragged front of snow-bright peaks. As we pedal along the bluffs of the Snake River, we are sure to spot osprey and eagles, herds of elk and bison, and with any luck, a moose. Flat sections with long rolling hills and shorter climbs. Moderate cycling level. 7 nights lodging, 7 breakfasts, 4 picnic and sack lunches, 6 dinners, snacks, park entrance fees, boat trip, detailed cue sheets, luggage transfer, van support & trained guides. $195 for Specialized road or hybrid bicycle designed specifically for women. $295 for electric-assist ebikes. Please note that anyone on an ebike cannot cycle about 17 miles of bike path on the last route of the tour. Instead she'll have to cycle in the road or ride in our van through that section. Fly into and out of the Jackson Hole, WY airport. WomanTours will provide a complimentary shuttle at 1:30pm from the airport or a downtown Jackson hotel to the start of the tour. The tour ends after breakfast in Jackson. You can take a taxi anytime to the airport. Or choose to drive and leave your car at the Jackson airport or our starting hotel in Victor. 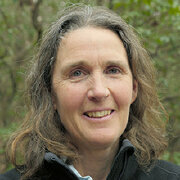 "I need to win the lottery and get to know all the guides! Loved the adventure, and this was the most amazing vacation!" DAY 1: We meet in the heart of Teton Valley in Victor, Idaho for a rental bike fitting at 3:00pm, an orientation at 5:30pm and dinner at 6:30pm. DAY 2: We start our tour with 20 flat miles on a bike path through the valley. We continue on quiet, rural roads through rolling farmland and the Targhee National Forest as we skirt the west side of the Teton Mountains. We’ll end the ride at Warm River and then shuttle to the town of West Yellowstone. If you have the energy, be sure to explore the town before dinner. Not only is the Grizzly and Wolf Discovery Center a fascinating place to learn about these endemic animals, the local bike shop has an espresso bar! 21 miles. 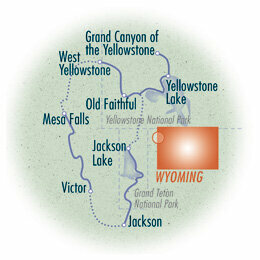 DAY 3: We’ll pass through the gates of Yellowstone National Park this morning by cycling along the Madison River. We’ll take a small detour to bicycle past the rushing Firehole Falls and then the rainbow-painted Grand Prismatic Spring. After a picnic lunch, we’ll head to our lodging for the night at Old Faithful. 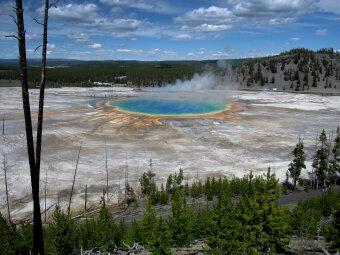 Situated beside the world’s most famous geyser, you'll be able to watch it explode hourly as often as you like. 34 miles. DAY 4: Today’s ride includes a gentle climb over Craig Pass and the Continental Divide to Lake Yellowstone. We’ll stay on the banks of the world’s largest alpine lake, a spot long known as a meeting place for Native Americans, European trappers and mountain explorers. Gorgeous views of the mountains will surround you. By now you probably understand how all the park lodges are roughly 40 miles apart from one another. We're cycling the same distances that stagecoaches could cover in a day back during the 1800s. 40 miles. 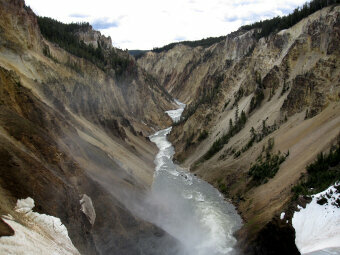 DAY 5: After breakfast, we will bicycle to the Grand Canyon of the Yellowstone. Created 600,000 years ago by huge volcanic eruptions, Rhyolite Canyon flow, and the melting of the last glaciers, this geologic wonderland is full of breathtaking views and roaring waterfalls. 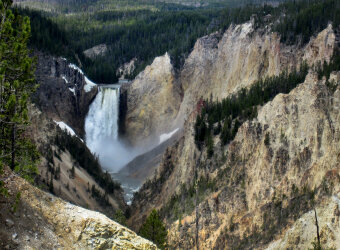 Be sure to stop at the famous Artist Point and at the Upper and Lower Falls overlooks. 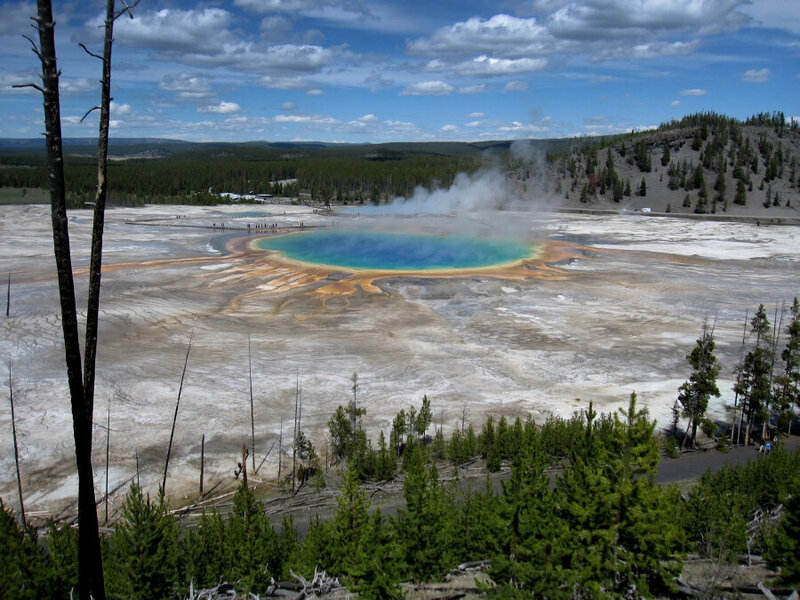 If you want more miles, then you can bike the optional out-and-back to Norris Geyser Basin, the hottest thermal area in the park. You’ll be treated with more views of bubbling hot springs, colorful pools and pungent steam vents. We'll shuttle to our cottages in Grand Teton National Park in the late afternoon. 21 or 45 miles. DAY 6: We take a well-earned day off the bikes today and shuttle to Grand Teton National Park. 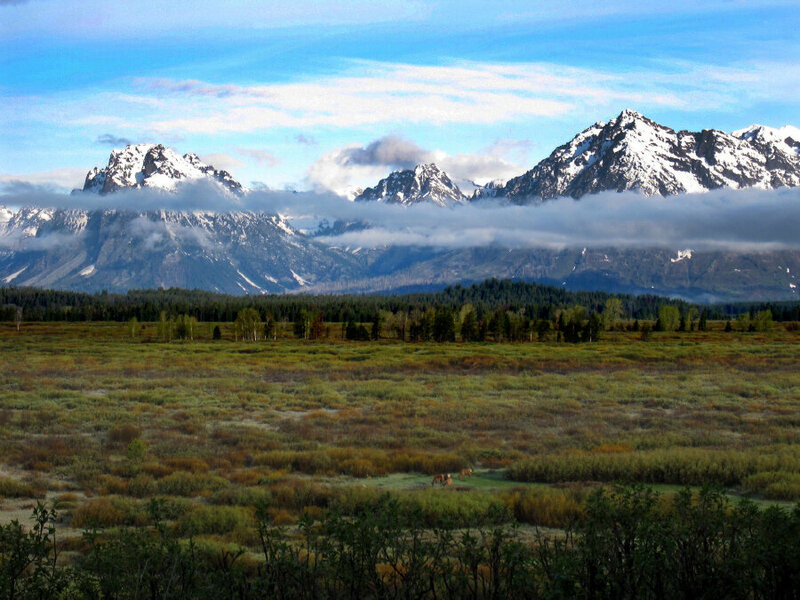 The park features the 40-mile long Teton Mountain Range with eight peaks over 12,000’. 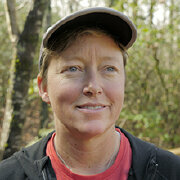 We’ll spend the afternoon with a hike on some of the 200 miles of trails. Then we’ll end the day with dinner and a boat trip to view the mountains and wildlife from another perspective. We'll try to spot eagles, osprey, elk and deer along the way. 0 miles. DAY 7: We'll get an early start on the day, when the morning sun on the mountains offers a spectacular photo opportunity. Wildlife can be particularly active at this time of day, so look for elk and moose grazing beside the road. Most of the day's bike ride is on a newly constructed paved trail into the town of Jackson. We’ll cycle alongside pristine, azure Jenny Lake. You can stop for lunch beside the river, and then continue the rest of the way into town. We'll say our good-byes over our last dinner together tonight. 36 or 46 miles. DAY 8: The tour officially ends after breakfast. You can take the 20-minute taxi ride to the airport anytime at your convenience. WomanTours, Inc. is an authorized permittee of Yellowstone and Grand Teton National Parks.